What is Carotid Artery Occlusive Disease? 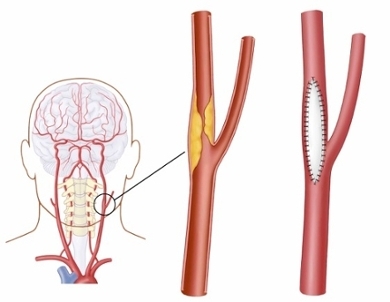 The carotid arteries are the primary arteries, located on either side of your neck, that supply blood to your brain. Carotid artery occlusive disease is caused by atherosclerosis. Atherosclerotic plaques accumulate in the walls of the arteries and cause them to narrow (stenosis), or become so thick they completely block the flow of blood (occlude). This disease process increases your risk of having a stroke. Approximately 20% of strokes are related to this disease. Most people with carotid artery disease don’t have any symptoms. The condition may be picked up on physical exam when your physician listens to your carotid arteries in your neck and hears a noise called a “bruit.” This may represent rough or rapid blood flow through narrow arteries. Patients with a bruit or with high risk factors for stroke should be screened for carotid artery disease. A person suffering a TIA is at increased risk for a major stroke. You should report TIA symptoms to your physician immediately. Do not dismiss them. One in three people who have a TIA will go on to have a stroke. A TIA is a warning sign to have a complete evaluation and learn what changes you and your physician can make to prevent stroke. Approximately 50% of people who suffer a stroke will die from the event. Of those who survive a stroke, approximately 50% will have some permanent neurological damage such as loss of use of an arm or leg or inability to speak. How Can I Know if I Have Carotid Occlusive Disease? Carotid ultrasound is used for screening and monitoring carotid artery occlusive disease. This test detects most cases of carotid artery disease. It provides information about how narrowed your carotid arteries are and how quickly blood flows through them. Occasionally additional studies are needed for confirmation of the blockage or to look at the brain itself. CT scan and CT Angiography (CTA): CT and CTA scans take x-ray images in the form of many thin slices. CT scans can show an area of the brain that has poor blood flow. CTA shows the arteries in the neck and head and will identify areas of arterial narrowing. Magnetic resonance angiography (MRA): MRA uses radio waves and magnetic fields to create detailed images of arteries. Angiography: Vascular surgeons use angiography to better visualize the anatomy and routinely use this during carotid angioplasty and stenting procedures. A contrast dye is injected through a catheter that is threaded into your arteries, and then live x-ray images are viewed. The images show the blood flow through the arteries and where they are narrowed. Diabetes: Maintaining Control of Blood Glucose. Regular screening for all Cardiovascular Disease is critical because diabetics are at increased risk for developing all of these conditions. High Cholesterol: Control with diet, and take statins if recommended by your primary care doctor. High Blood Pressure: Control with exercise, diet, and medication if necessary. Treatment plans for carotid artery disease are intended to prevent further stenosis, occlusion and stroke. A plan begins with correcting modifiable risk factors such as controlling diabetes, high blood pressure. Statins are medications prescribed to lower cholesterol levels as well as decrease the inflammation in arteries that causes increased plaque development. Aspirin or another medication to keep blood platelets from sticking to plaque and causing occlusion is commonly recommended as well. Smoking cessation is absolutely necessary to prevent progression of the disease! If there is mild to moderate stenosis in the arteries, but you don’t have any symptoms, you will be monitored regularly with ultrasound studies of the arteries to evaluate the stability of the flow through them. You can have severe narrowing and not have any symptoms. If the plaque enlarges and the stenosis becomes severe (greater than 80% narrowing), surgery may be recommended to decrease the risk of stroke, whether or not you have symptoms. Carotid Endarterectomy: This procedure removes the plaque that is causing stenosis from the artery. It is performed through a small incision on the affected side of the neck. The artery is opened and the plaque is removed. The artery is closed by sewing a patch of vein or artificial material onto the artery after the plaque is removed. Use of the patch closure reduces the risk of restenosis or occlusion. Most patients are able to return home in one to three days after surgery. Carotid Artery Balloon Angioplasty and Stenting: This is a minimally invasive procedure that is usually performed using a local anesthetic. It has been approved for the treatment of patients with symptomatic carotid artery disease who are considered to be too high risk for carotid endarterectomy. To perform this procedure, your vascular surgeon inserts a long, thin tube called a catheter through a small puncture made over a groin artery and uses angiography to guide it through your blood vessels to your carotid artery. The tip of the catheter has a tiny balloon that the surgeon inflates and deflates, flattening the plaque against the walls of the artery. The surgeon places a tiny mesh tube called a stent in the artery to hold it open. The stent will remain in the artery.